The CMIO role in today’s healthcare organization has never been more challenging. To better equip physician leaders filling this important position, CHIME will host the fourth annual CMIO Leadership Academy (formerly known as CMIO Boot Camp). Designed for physicians currently in CMIO or Associate CMIO positions seeking to take their role to the next level, this curriculum is modeled on the highly successful CHIME Healthcare CIO Boot Camp™. This program’s leadership content is specifically tailored for CMIOs to gain the real-world skills necessary for today’s successful physician leaders. Taught by a faculty of healthcare CIOs and CMIOs, this intensive program features a collaborative teaching methodology combining presentations, small group discussions, case study analysis, progressive problem solving, and personal mentoring – focused on equipping CMIOs to be successful leaders working with the executive suite and CIOs. To secure the discounted room rate of $270.00 (single/double) per night for the CMIO Boot Camp, you may book your hotel reservations online. Be sure to enter the group discount code of AMDIS19. Or telephone the hotel reservations department at 800-233-4100 to make your reservation. Additional charges include current room tax of 10%. A one-night room and tax deposit is required to hold the reservation. Rooms fill QUICKLY be sure to make your reservations EARLY! Should you need to cancel your reservation, you must do so no later than 72-hours prior to the date of your arrival. Be sure to obtain a cancellation number to receive a full refund of your deposit. Located 60 miles North of Los Angeles and 12 miles off the ocean lies the world-renowned Ojai Valley. 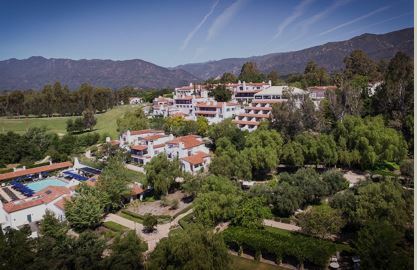 Accessible seclusion is what has made this Southern California resort famous for so many years. Los Angeles International Airport, Santa Barbara and Burbank are easily accessed and offer a short transfer to the Inn. Santa Barbara International is located 25 minutes from the resort offering direct and non-stop flight options from many destinations. Burbank Airport is located 60 minutes from the resort offering direct and non-stop flight options from many domestic destinations. Los Angeles International is located 85 minutes from the resort and offers the most travel flexibility from hundreds of destinations worldwide. Attire for the Leadership Academy is business casual. Please remember to bring a sweater or jacket for air-conditioned meeting rooms. Space in The Leadership Academy is limited to a maximum of 35 participants. The registration fee includes all program materials; coaching/mentoring from one of the CIO faculty members; continental breakfasts, lunches, and receptions. Please note that payment for the CHIME CMIO Leadership Academy registration fee is due no later than May 13, 2019. If full payment is not received on or before May 13, 2019 your registration is subject to cancellation. All funds must be in U.S. dollars. Checks should be made payable to the College of Healthcare Information Management Executives and mailed to 710 Avis Drive, Suite 200, Ann Arbor, MI 48108. Prepaid registrants who cancel in writing on or before May 13, 2019 will receive a full refund; cancellations received after May 13, 2019, no refunds will be issued. Please note: Attendance is not transferable to another person or to another offering of the program. Howard Landa, M.D. is the Vice President of Clinical Informatics and EHR for Sutter Health since 2017. He is a pediatric urologist and a clinical Informaticist who has held leadership positions in Safety-net organizations (Alameda Health System), Health Maintenance Organizations (Kaiser Permanente) and academic institutions (Loma Linda University). He has been recognized as one of the leading Informaticists in the Country (Modern HealthCare’s top 25) and is the Chairman of the Association of Medical Directors of Information Systems (AMDIS). Howard got his Medical Degree at what is now Robert Wood Johnson School of Medicine and trained for two years in General Surgery at New York University Medical Center. He completed his Urology residency at UC-San Diego and Pediatric Urology fellowship at Texas Children’s Hospital. Dr. Natalie Pageler is a board-certified pediatric intensivist and board-certified clinical informaticist. She is the Chief Medical Information Officer at Stanford Children’s Health and a Clinical Associate Professor of Pediatric Critical Care and Systems Medicine at the Stanford University School of Medicine. Dr. Pageler also holds a Master’s Degree in medical education, and focused her thesis project on the impact of computerized clinical decision support tools on clinician’s knowledge, behaviors and attitudes. Through her clinical and administrative positions, she has spearheaded the development of innovative computerized clinical decision support tools to provide point-of-care education to clinicians and enhance quality of care, efficiency, and patient safety, and has published the outcomes of this work. Dr. Pageler is also one of the founding associate program directors of the first ACGME-accredited fellowship in clinical informatics, located at Stanford University. His long-standing quest to promote evidence-based medicine led to an Association of Medical Directors of Information Systems (AMDIS) Award in 2005 for his success in a CPOE implementation at a community hospital. In 2011, he received another AMDIS Award for his championing the EHR’s role in the quality improvement efforts at HealthEast. He was also named to Modern Healthcare’s Top 25 Clinical Informaticists in 2012 and was named as one of 30 leading CMIO experts by Health Data Management in June of 2016. Medical Center. He also holds a masters degree in Medical Management from Carnegie Mellon University. He has been recognized as Healthcare Informatics’ Innovator of the year for Children’s Analytics program, as well as the AMDIS Award in Applied Medical Informatics. Modern Healthcare named him one of the 25 top Clinical Informaticists and Becker’s Healthcare included him in their 25 CMIOs to know list. Contact Jessica Hadley at [email protected] for more information on sponsorships.